Parkinson’s Disease (PD) is an incurable progressive degenerative disease of the central nervous system. The condition is caused by the death of nerve cells in the brain that produce the neurotransmitter dopamine. There are around seven million people worldwide and one million people in the U.S. living with PD and about 60,000 people are diagnosed with PD every year. PD is associated with aging as the vast majority of patients are diagnosed after age 50. In fact, it has been speculated that everyone would eventually develop PD if they lived long enough. Its physical symptoms include resting tremor, slow movements, muscle rigidity, problems with posture and balance, loss of automatic movements, and slurring of speech. PD itself is not fatal but is often associated with related complications which can reduce life expectancy, such as falls, choking, and cardiovascular problems. Parkinson’s Disease (PD) also has psychological effects, especially cognitive decline, anxiety, and depression. All of these symptoms result in a marked reduction in the quality of life. There are no cures for Parkinson’s Disease or even treatments to slow its progression. There are only treatments that can produce symptomatic relief. So, there is a need to discover new and different treatments. Mindfulness training has been found to improve the psychological symptoms and the quality of life with PD patients. In addition, Qigong has been shown to improve the symptoms of Parkinson’s Disease. Hence, Tai Chi and Qigong may be an excellent treatment for the symptoms of Parkinson’s Disease. In today’s Research News article “The impact of Tai Chi and Qigong mind-body exercises on motor and non-motor function and quality of life in Parkinson’s disease: A systematic review and meta-analysis.” (See summary below or view the full text of the study at: https://www.ncbi.nlm.nih.gov/pmc/articles/PMC5618798/ ), Song and colleagues reviewed, summarized, and performed a meta-analysis of the published research literature on the effectiveness of Tai Chi practice for the relief of the symptoms of Parkinson’s Disease. They found 21 studies, including 823 total patients with an average age of 67.5 years, 15 of which were randomized controlled trials and 8 contained active control conditions. No adverse events were reported. They found that Tai Chi practice produced significant improvements in motor functions, balance, Timed-Up-and-Go (getting up from chair, walking 3 meters, and sitting back down), walking speed, and falls. Tai Chi practice was also found to significantly improve the psychological state of the patients with significantly lower levels of depression and increases in quality of life. Hence, Tai Chi practice produced important improvements in the motor ability and psychological state of patients with Parkinson’s Disease. 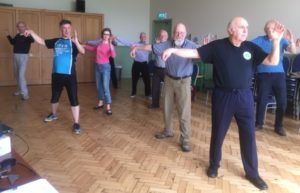 These findings are significant and important suggesting that Tai Chi practice is a safe and effective treatment for the symptoms of Parkinson’s Disease. Tai Chi and Qigong are ancient mindfulness practices involving slow prescribed movements. They are gentle and completely safe, can be used with the elderly and sickly, is inexpensive to administer, can be performed in groups or alone, at home or in a facility or even public park, and can be quickly learned. In addition, it can also be practiced in social groups without professional supervision. This can make it fun, improving the likelihood of long-term engagement in the practice. So, improve Parkinson’s Disease symptoms with Tai Chi. Tai Chi/Qigong is a mind-body intervention that has the potential to address motor and non-motor symptoms associated with Parkinson’s disease. Mixed results for motor outcomes have been reported, while even less attention has been devoted to systematically evaluating the effects of Tai Chi/Qigong on non-motor outcomes. Our meta-analyses indicate clinically relevant effect sizes in favor of Tai Chi/Qigong for motor function, balance, and quality of life, and significant effect sizes persisted even when comparisons were limited to active controls. To systematically evaluate and quantify the effects of Tai Chi/Qigong (TCQ) on motor (UPDRS III, balance, falls, Timed-Up-and-Go, and 6-Minute Walk) and non-motor (depression and cognition) function, and quality of life (QOL) in patients with Parkinson’s disease (PD). A systematic search on 7 electronic databases targeted clinical studies evaluating TCQ for individuals with PD published through August 2016. Meta-analysis was used to estimate effect sizes (Hedge’s g) and publication bias for randomized controlled trials (RCTs). Methodological bias in RCTs was assessed by two raters. Our search identified 21 studies, 15 of which were RCTs with a total of 755 subjects. For RCTs, comparison groups included no treatment (n=7, 47%) and active interventions (n=8, 53%). Duration of TCQ ranged from 2 to 6 months. Methodological bias was low in 6 studies, moderate in 7, and high in 2. Fixed-effect models showed that TCQ was associated with significant improvement on most motor outcomes (UPDRS III [ES=-0.444, p<.001], balance [ES=0.544, p<.001], Timed-Up-and-Go [ES=−0.341, p=.005], 6MW [ES=−0.293, p=.06]), falls [ES=−.403, p=.004], as well as depression [ES=−0.457, p=.008] and QOL [ES=−0.393, p<.001], but not cognition [ES= −0.225, p=.477]). I2 indicated limited heterogeneity. Funnel plots suggested some degree of publication bias. Evidence to date supports a potential benefit of TCQ for improving motor function, depression and QOL for individuals with PD, and validates the need for additional large-scale trials.